Michelle Brown got her first taste of criminology when she volunteered at women’s shelters and saw first-hand the limited impact of harsh crime policies. “The women in the shelters taught me that criminal justice interventions such as arrest, court cases, jail, and imprisonment of their partners often forced women to relive their trauma and put them at risk of losing their children or jobs,” said Brown, who started her academic career as a comparative literature major with a concentration in film studies. After her experiences in the women shelters, she switched to the study of crime and criminal justice. Throughout her career, Brown, an associate professor in the Department of Sociology, also has worked with community organizers and activist scholars and artists who seek to push back against mass incarceration and point to socially-just alternatives. 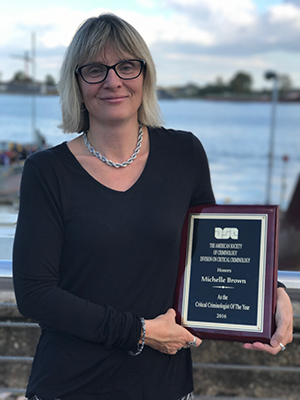 Because of her work in the growing field of critical criminology, Brown was named the 2016 Critical Criminologist of the Year by the American Society of Criminology. The award honors distinguished scholarship, teaching, and service in the field. Brown works to find alternatives to mass incarceration. Her research contributes to a new subfield, visual criminology, which emerged from a call to rethink the manner in which images are reshaping the world of criminology. Professionals and scholars in the field of critical criminology reject the notion that the biggest social concerns are violations of the law. Instead, they call attention to pervasive social patterns that are at the roots of harm, such as poverty and unemployment, limited access to good education or healthcare, and social inequalities defined by race, gender, sexuality, etc. Visual criminologists track how the various optics of criminology and criminal justice are produced, which culminates in popular and scientific perspectives that often conflict. As a visual criminologist, Brown helps bring attention to production of crime’s power and control in terms of prisons, policing, and surveillance. She also looks at the production of resistance, such as social movements, justice campaigns, and insurgencies and uprisings. “What is really amazing is how many models of this kind of work we have at the grassroots level across the United States. Vera’s Common Justice Program and Chicago’s Project NIA are two excellent examples, as is the national platform of The Movement for Black Lives,” says Brown. According to most criminologists, their work is more vital than ever in the current historical movement. Brown hopes the recognition of her work continues to increase the national and international reputation for critical criminology in the Department of Sociology, which is dedicated to social justice and meaningful alternatives to contemporary policing, imprisonment, and criminal justice practices.